A lot of people have asked me whether it’s possible to put a different collar on the Banksia top – of course!! And it’s so easy to change the existing collar pattern to something a little different. You can even leave the collar off completely if you want. There are really endless things you can do when adjusting a collar, but I’ve decided to show you two of my favourites. I’m calling this a pointed flat collar, as I think that’s the name that will be most familiar to people – but to be honest, I think this is probably closer to a Chelsea collar. Anyway, I really love this one – and if you’re one of those people who find peter pan collars a bit too “pretty pretty” – then this might be the one for you! 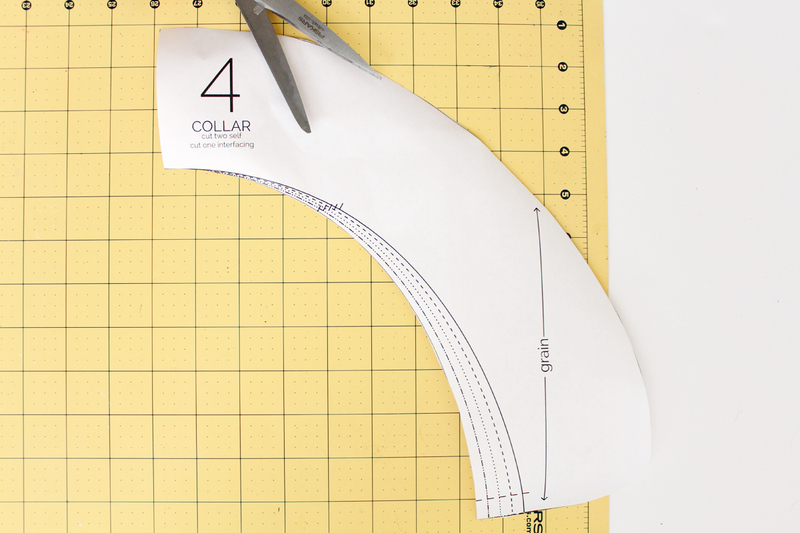 I think it’s easiest (and most accurate) to draft collars in the half, so the first thing I like to do is cut the collar in half. 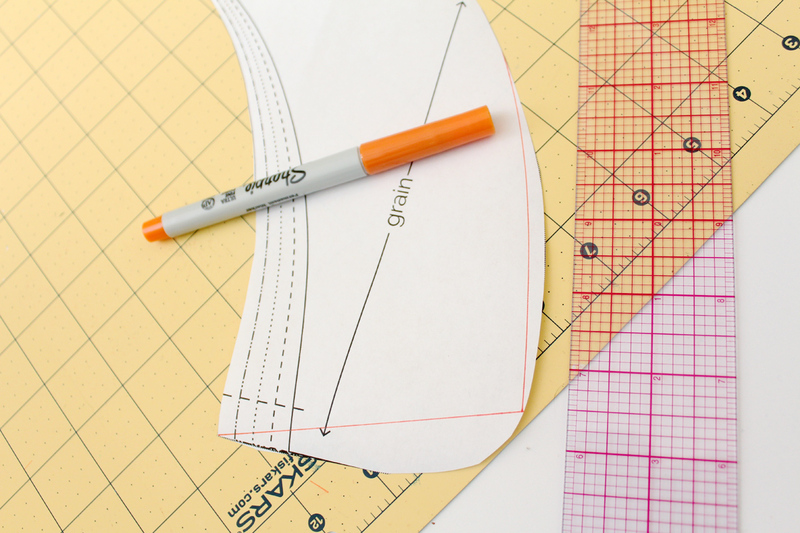 Draw a straight line down the front of the collar as above. 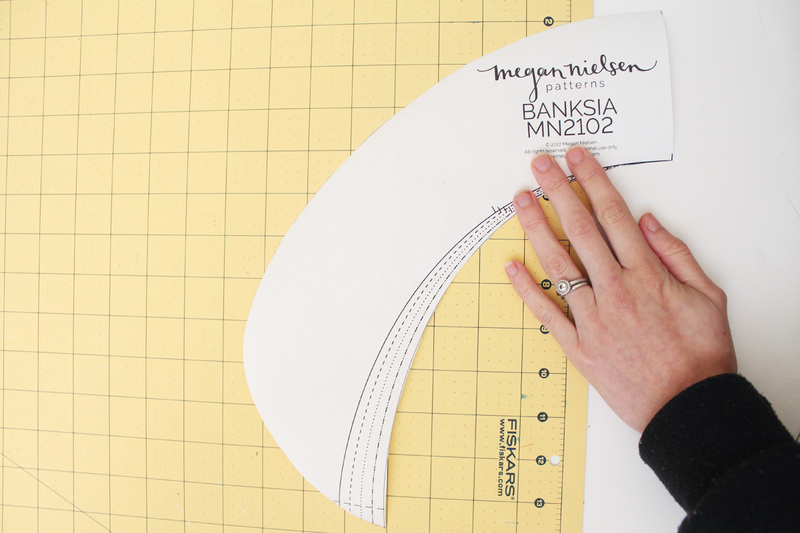 How steep you decide to make this line is up to you, but make sure you start from the very outside edge of the centre front as shown – that way you won’t need to alter neckline at all, and won’t mess with the seam allowance. 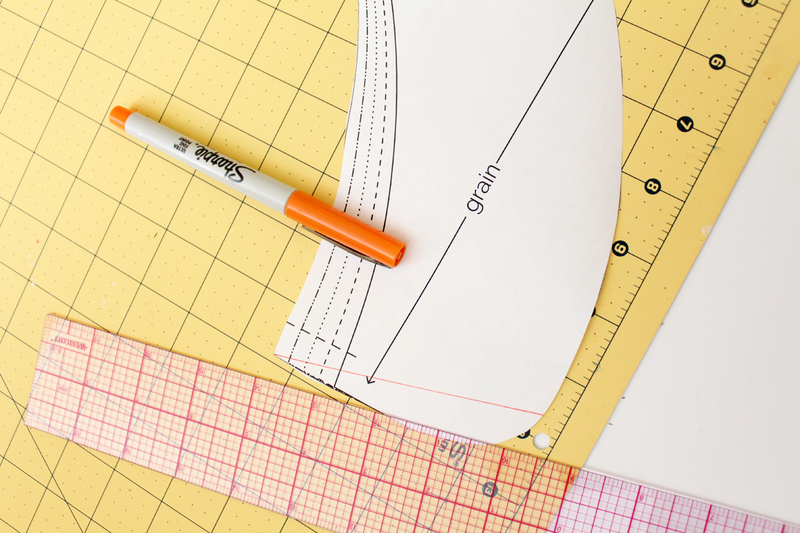 Now we need to blend the point into the curve of the collar – you could just draw a straight line but I think that looks too harsh and doesn’t sit as nicely. I prefer to draw a slight curve (it still looks pretty straight). Cut it out and you’re done! I’m calling this one a faux shawl collar because it gives the appearance of a shawl collar without actually being one. That was worded strangely but I think you know what i mean hehehe. It should look quite similar to this one. Once again we’re going to draft in the half. So cut the pattern in half down the centre. Starting at the centre front again, i used a curve ruler to blend into the original collar. Cut out and you’re good to go! 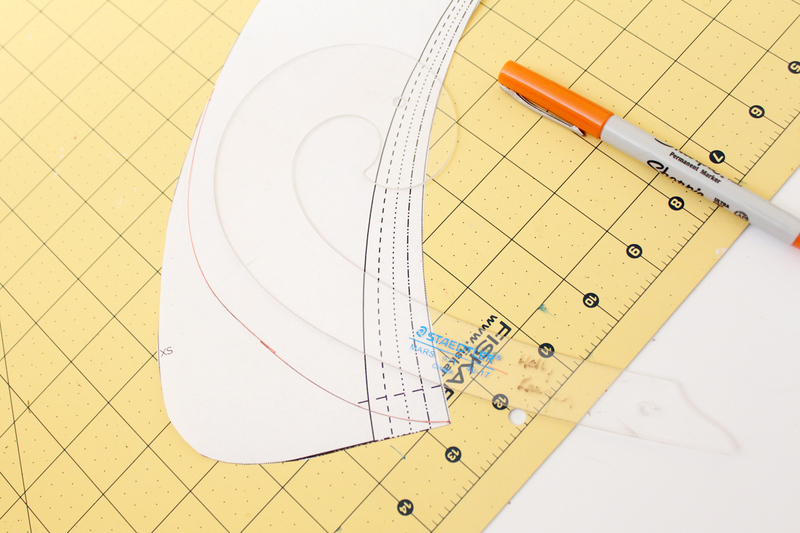 I love the idea of adding piping or trim to the outer edge of the collar like this top. I think it would be really cute to layer two collars. 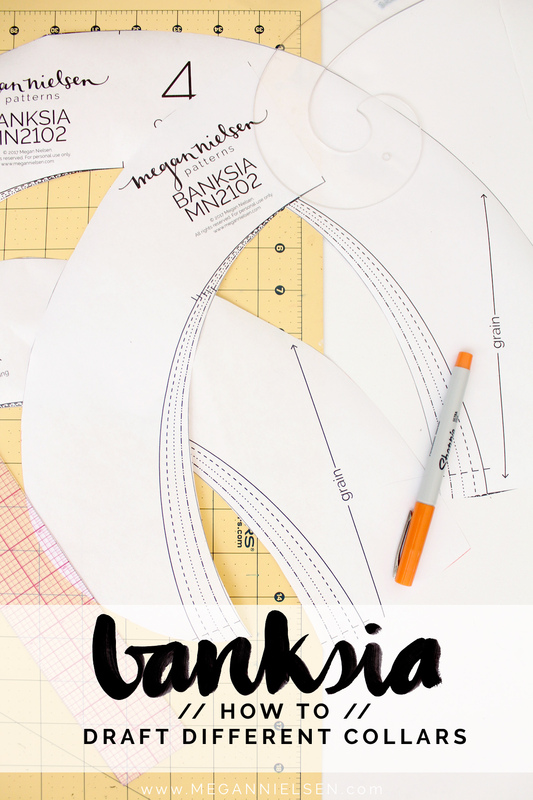 I adore this top – and i think of you cut a pointed collar as above, and then drafted a smaller one and layered it on top it would look killer! 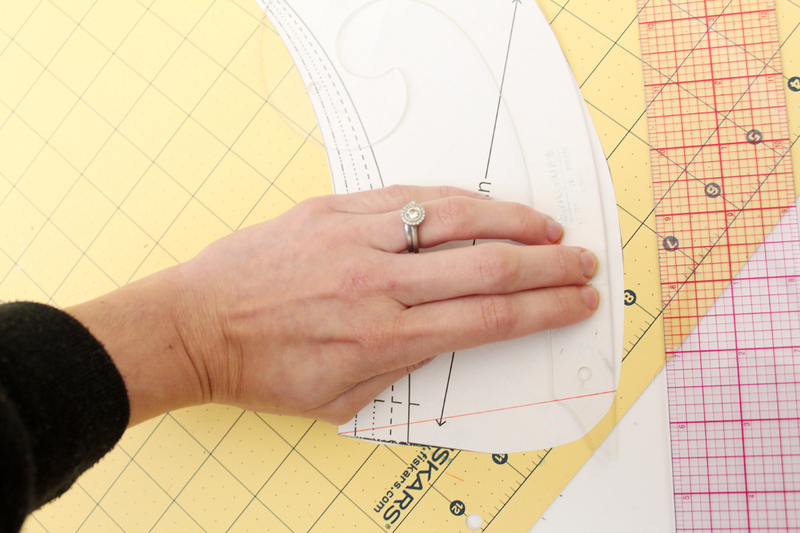 Obviously I love scalloped edge collars – and we have a tutorial for one right here! Ah… I’m still stuck in choosing which fabric I’m gonna use! And now it got even more difficult with all the collars. I really like all the different collars, especially the beaded one and the one Casey made with tutorial. what to do what to do?! Oh i know just what you mean! Isn’t fabric choice the hardest part?? Anyway, i think making a beaded one that is removable is a fantastic idea! i wish i’d thought of it! It would definitely make washing easier – and also give you two tops in one :) genius! collars, collars, and collars. Your tutorial was great, as per usual, but I just wanted to chime in and say why I like collars – they frame the face so well. Any face, round, square, circle, or heart shaped, looks great it a collar. Don’t you agree? Thanks for the tip. 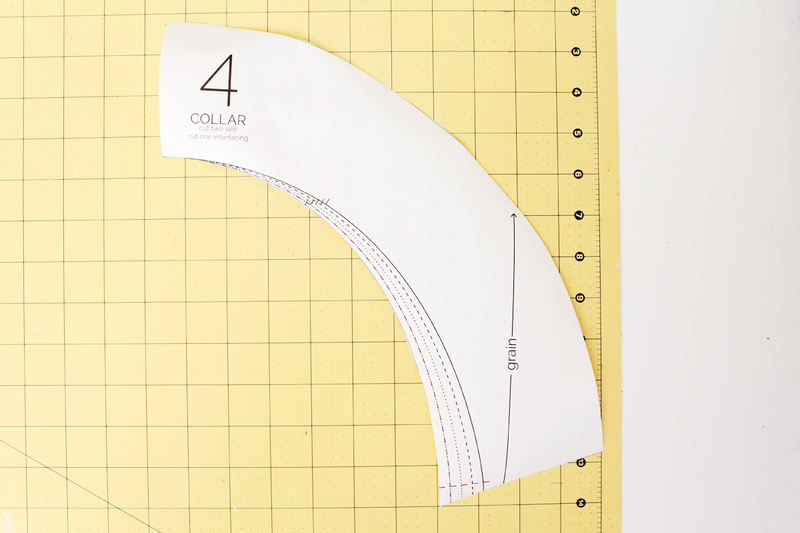 These collar options and easy to follow instructions look like they should work with just about any pattern. Think I’ll give it a try on one of my favorite jacket patterns.